The cheapest and always available. The suns reflection off a power pole insulator. It doesn't look so bright because it's light is spread across several pixels in your eye when not using the telescope. If you can get one of these mirrors up high enough and far enough they make good artificial stars in the daytime. At night put a piece of foil over a flashlight with a half inch hole in the foil and place the flashlight about 10 feet from this mirror. 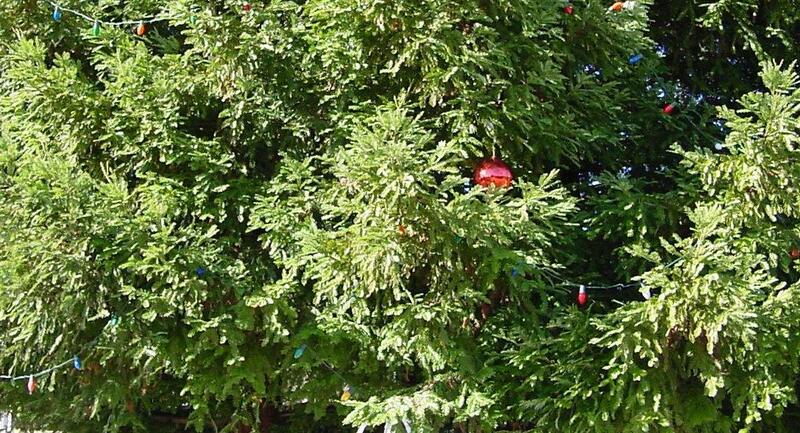 Christmas lights and ornaments make good artificial stars. Mr. Dobson told me he once used the reflection from an owls eye for mirror testing. 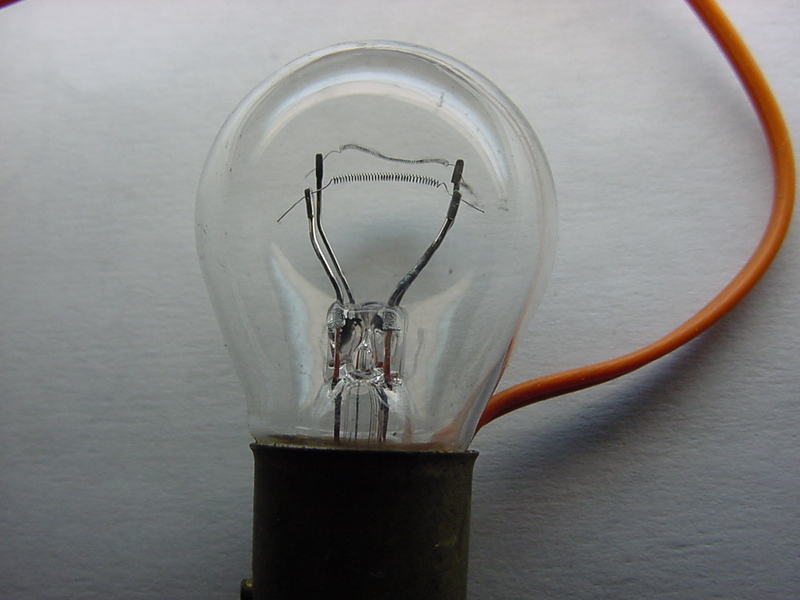 Here is a 12 volt dual filament 1157 automotive lamp. The small filament is for running lights, the high amperage filament for brake lights. 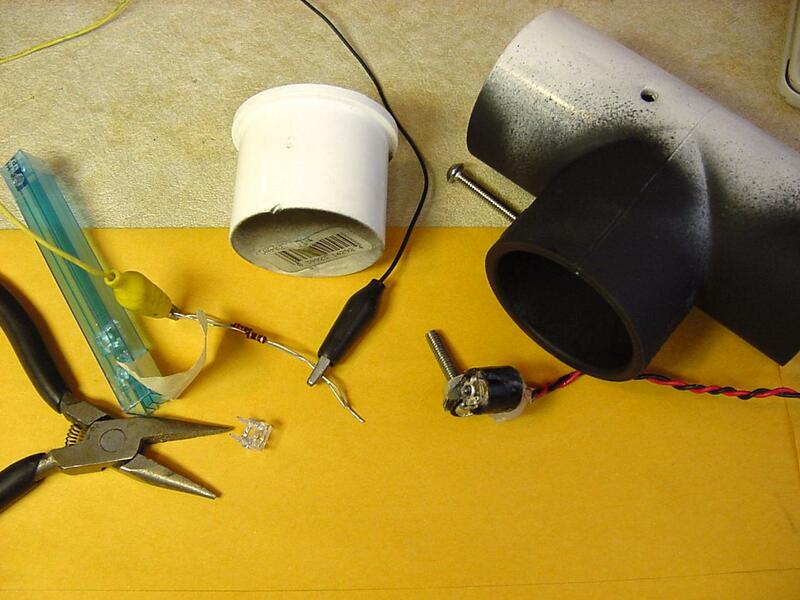 Its easy to solder to the base of these lamps or you can buy an automotive light socket. The straight filament is important. It can be aligned with the lines of the ronchi grating or with the knife edge. These lamps need to be run from a car battery. Put an inline fuse in the clip leads to avoid a burn or fire. Here we experiment with the 1157 lamp reflected in the telescope mirror. It is too bright for testing at the center of curvature, even using the low amperage filament. Using the high amperage filament would make a star useable at 1000 feet. Going more distant than 1000 feet with our artificial star would just add more heat waves with no measurable improvement when testing spherical aberration. 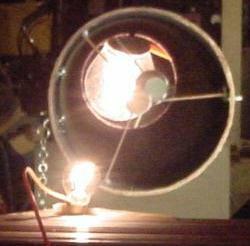 Most mirror test sets use a flashlight bulb, often with some means to vary the voltage. Here is an inexpensive LED, light emitting diode. LED's are much more efficient at turning electricity into light than are light bulbs. Most of the energy used by light bulbs is turned into heat. This LED will run for days on a lantern battery. 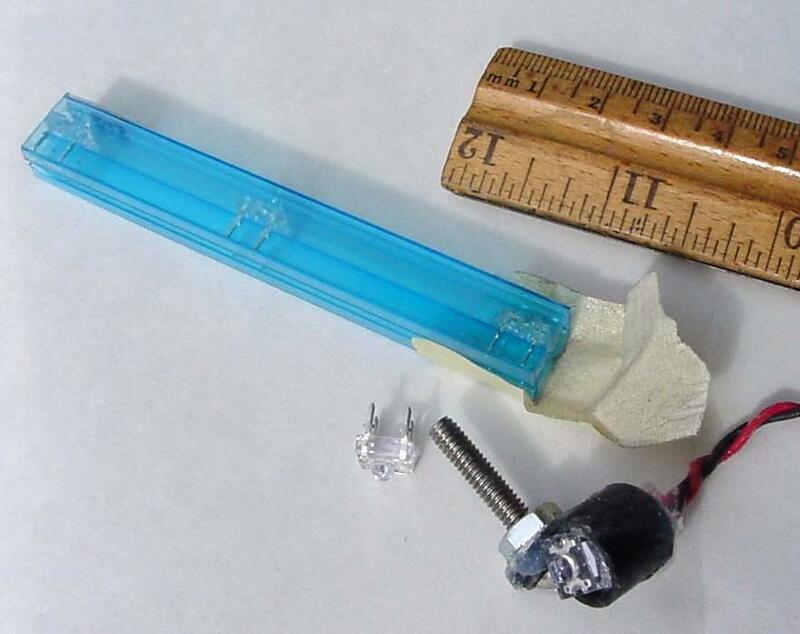 The Stellafane website has a design for a tester using an LED. Here we have a packet of LED's intended for red traffic signals. They are made by Agilent Technology, formerly Hewlett Packard. I have carefully soldered wires to one of the LED's using a heat sink. I then glued it into a plastic clamp using silicon sealant. These traffic light LED's are very bright and efficient. We selected a series resistor to limit the current of a lantern battery. We have included instructions for selecting a series resistor. We used another plastic clamp to make a strain relief for the zip cord and mounted everything in 1 1/4 inch PVC pipe we painted black inside. The assembly can be taped to a lamp post with masking tape. At 600 feet it is almost too bright so we ordered a negative lens from Edmund Scientific to de-magnify the LED. CAUTION, laser light causes eye damage. Here we are at Chabot. The traffic light LED is mounted below the automotive reflector on a light pole at 600 feet. The reflected laser is almost too dim. The brightness of the reflected laser decreases as distance to the fourth power as with radar. The LED brightness decreases as distance squared. There are many guests at Chabot and the LED is probably a better choice in this less controlled environment.